It’s January 1995, and Franny Banks has just six months left of the three-year deadline she set for herself when she came to New York, dreaming of Broadway and doing “important” work. But all she has to show for her efforts so far is a part in an ad for ugly Christmas sweaters, and a gig waiting tables at a comedy club. Her roommates?her best friend Jane, and Dan, an aspiring sci-fi writer?are supportive, yet Franny knows a two-person fan club doesn’t exactly count as success. Everyone tells her she needs a backup plan, and though she can almost picture moving back home and settling down with her perfectly nice ex-boyfriend, she’s not ready to give up on her goal of having a career like her idols Diane Keaton and Meryl Streep. Not just yet. But while she dreams of filling their shoes, in the meantime, she’d happily settle for a speaking part in almost anything—and finding a hair product combination that works. Charming, heartwarming and full of humor, Someday, Someday Maybe is about the joys and struggles of being young and carefree in a big city. Its about believing in the beauty of dreams and chasing them without losing hope. Its a story about making mistakes – in life and in relationships but knowing when to hold on and when to let go. Franny Banks, the twenty something protagonist has always dreamed of being an actress. After finishing college she comes to New York giving herself a three-year deadline to make a career out of acting. However, since time flies, its January 1995 and only six months are left of the deadline Franny set for herself. Her achievements so far include one advertisement for bulky, ugly Christmas sweaters. A part- time waitressing job at one of the many comedy clubs makes it possible for her to pay the bills, and barely so. But quitting, is the last thing on Franny’s mind and for some inexplicable reason she believes that everything will fall into place and all her dreams will come true. The beginning of the book was a tad bit slow, as in there was little to no movement in the storyline, but Lauren Graham’s witty, entertaining narration totally makes up for it. Franny is delightful, even if a bit quirky and oh so human. She has her flaws and insecurities but that doesn’t stop her from being absolutely determined to follow her dreams and draw crazily optimistic conclusions for auditions gone wrong because after all she knows she is talented. Franny is warm and fierce with an amusing self-deprecating humor. She also possesses an unavoidable need for external validation, a not-so-good quality of hers that she is well aware of and constantly working on. I must work harder to achieve my goal of not seeking approval from those whose approval I’m not even sure is important to me. Her roommates are both solidly developed characters as well – the sassy best-friend from school, Jane and the brooding, slightly nerdy struggling sci-fi writer Dan, both of whom are always supportive to Franny’s acting career. Along with these there are plenty of other interesting individuals in the story, a delicate and full-of-herself talented actress in class, another successful and very handsome classmate who is totally crush-worthy, strange agents and an even stranger audition crowd. 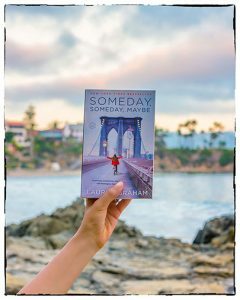 Even though the plot is fairly predictable, Someday, Someday Maybe is a sweet, funny and hopeful story, an amusing and enjoyable read that has several relatable laugh-out-loud moments and a gentle message, that if you want something deeply, desperately enough, you’re bound to get it someday. A lovely book to spend an afternoon with, for readers who enjoy contemporaries.